Some projects push limits and approach a design in a new way, this cross-over collar Aran doll sweater is just that. 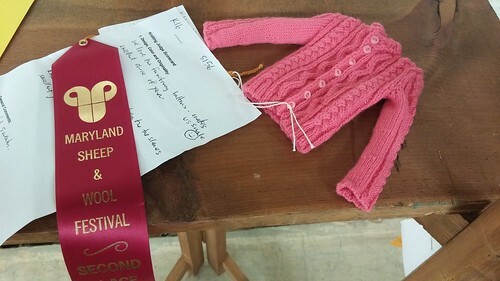 My friend Marseille knit this doll sweater for the Maryland Sheep and Wool festival this past May. The process was thoughtful and the result is charming… and ribbon-winning. Now, let’s go back to the process of knitting this tiny intricate doll sweater. Here’s how Marseille knit this cross-over collar Aran doll sweater to submit to the 2017 Maryland Sheep and Wool. 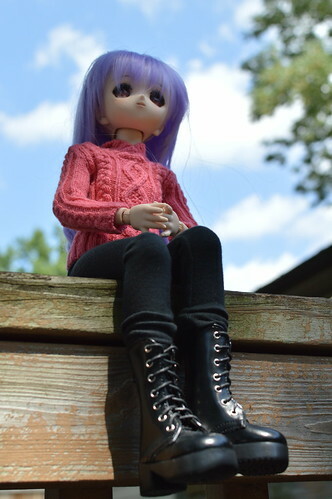 The original Cross-over Collar Aran-CH for 14″ Kish Chrysalis Dolls is by Becky Colvin, though Marseille re-engineered this design a lot to create exactly what she envisioned for Mimi. Marseille used a tubular 2×2 cast-on from the Cap Sease book. 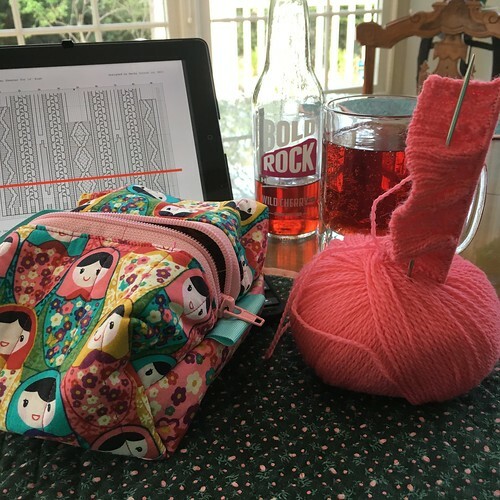 She also opted for a standard Kitchener at shoulders, instead of three-needle bind off. She worked sleeves two-at-a-time, in the round. Bind off for collar is the Kitchener Double-Rib Bind Off from the Cap Sease book. Then Marseille added narrow plackets at the back to accommodate the buttons–picked up stitches, worked a row plain, did eyelet buttonholes, worked another row, bound off. She used Knit Picks Palette in Petal colorway. 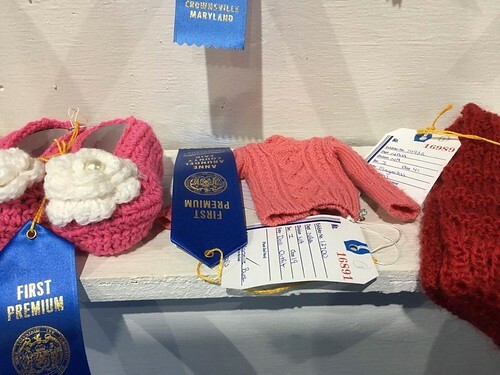 The sweater won a Red ribbon (second place) at Maryland Sheep and Wool, 2017 and a Blue ribbon (first premium) at Anne Arundel County Fair, 2017. 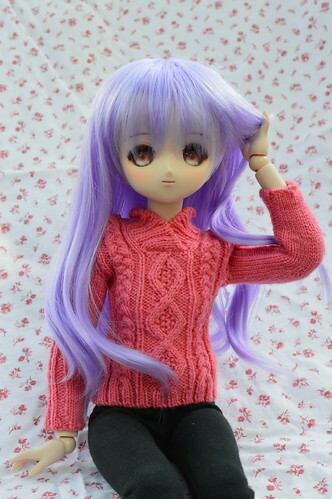 Here is Mimi modelling the sweater. Buttons: Seven tiny pink ones. This entry was posted in Knit Toys & Dolls and tagged Marseille. This is beautiful and so technically challenging for Marseille. I am so glad she won a ribbon for it! Thanks for sharing. Definitely! 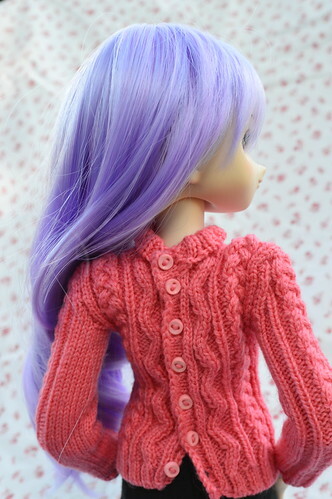 The intricacy of knitting for dolls is impressive enough, but then adding cables and itty bitty buttons?! Marseille’s knitting never ceases to impress me.